Note: These abridged remarks are from the transcript notes made during a meeting at Industrial Light & Magic, on May 27, 1980. 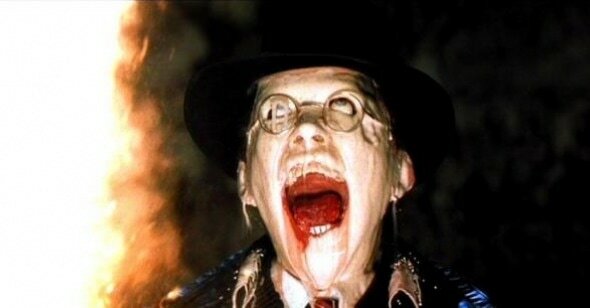 Some of this appeared in my book The Complete Making of Indiana Jones, but this is the longer version. Steven Spielberg: I want to go through some of the boards that Joe [Johnston] brought out. Joe Johnston: What we have is a sequence that shows the fire, which seems to have intelligence. It can swirl around certain things. It looks like the best way to do this is to shoot a lot of material and use that for an animation guide—and then have a very good animator come in who can combine the ideas from the materials we shoot. George Lucas: We should keep ourselves open. Rather than say, ‘We'll just animate it,’ I think we should explore alternatives. If we do find a good animator, then we have both. It would be great if we could come up with a completely new photographic event that nobody has ever seen before, because there are still a lot of areas that can be explored. What we ought to start doing is exploring all types of film—microfilm, infrared, foreign film, Fuji—and start playing with the film itself. Whenever we do an experiment, we should do it with three or four kinds of stock, even stock that we don’t normally use for movies. Spielberg: I’m really interested in seeing some fog effect where we can control exactly where the fog goes, like an octopus with tendrils, and very strange things that look real spooky. Johnston: The clouds form into a halo and the troops gather. 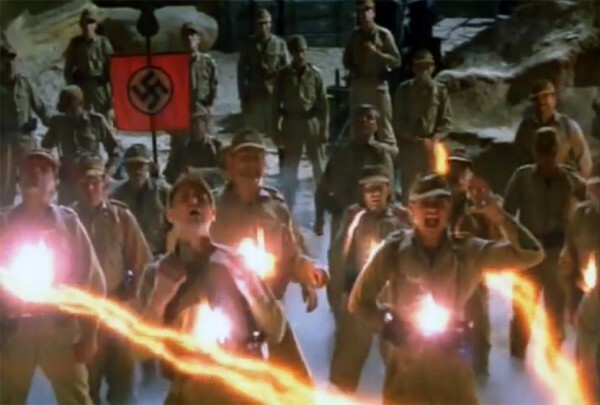 Belloq starts his incantation, but the Nazi standard dances with sparks. The guy drops it and it shatters, oxidizes, the floodlights blow. I think it would be neat if, during all the preparation, they had this generator running and making background noise—but once it blows, you realize the Ark itself has this audible sound. Mike [Fulmer/Lloyd? ]: After they open it up, the Ark is not trying to harm them; it’s kind of suckering them in. It’s magnificent and beautiful and awesome, a big display of light. They get a feeling, well, they really did capture the Ark and they will be able to use it to their own purpose. But this effect starts to fade away, and what happens then, an offbeat idea, is some time-lapse photography of bizarre and exotic orchids or flowers that you could diffuse. Spielberg: Like a death orchid or something. Mike: These tentacles would come out, like you were talking about, and change into these death angels. [unknown speaker]: They open the Ark and at first nothing happens, and then this very fine mist begins to come out and all these people are mesmerized; they can't take their eyes off it. This [dirx] is an indication of what would happen if the mist comes around him, and he’s not sure what to do with it. At first it is really beautiful, but then it reveals itself as a very hideous face, which, of course, if you look at it, it turns you into salt—his face actually turns to rock. They’re all turning into stone. Marion and Indy are resisting all this. It is then that the giant light-effect leaps out of the Ark. We call it “Cosmic Concussion,” and it blasts out, and then we see a lot of really quick cuts of the people just being... obliterated. All the energy and that light and all those particles form up into a large energy comet. Marion and Indy have been keeping their eyes closed, so they haven’t been victim to all this—but they’re buffeted around—and then we have various shots from on high—a stream of Angels—the spirits are making one last attempt to get Marion and Indy to look, and they blast through their hands, but they’re not tempted sufficiently. So finally everything, as in the genie’s lamp, goes back into the Ark. Spielberg: We’ll begin the sequence the last week of August... if we’re on schedule. [unknown speaker]: It’s important now to do a live-action story board, do it and maybe improve it, come up with some interesting effects—that’s gonna help you on the set. Spielberg: I’ve got to know when I can and can’t move the camera. The people don’t have to be real in a long distant shot... I have another question about another effect. I’ve augmented a scene where the Ark is sitting in the hold of the Bantu Wind and the Germans have stamped the box. Rats are all over the place. The idea is the Ark is humming and the camera’s moving in closer and closer to the Ark, through the rats. The rats are cowering. And as we go in to the Ark the swastikas dissolve; the Ark’s getting rid of all the swastikas. I think that’s something better done over there. It’d be much better doing it live-action. [unknown speaker]: The disintegration in stages should happen really fast. The bones and the flesh are just blown away. Spielberg: Like he’s still alive and torn apart. Lucas: The one interesting effect in Star Trek [The Motion Picture, 1979] was when they were going through the time warp and putting everything out of register, having everything shake to the point where it seems like the cameraman is just trying to shoot all this stuff, but the whole thing has gotten completely out of hand. Spielberg: I’ll tell you where that was done really well: in Dr. Strangelove , when the airplane was hit by the missile and the camera was shaking. [unknown speaker]: What sort of cutting pace do you think we're going to have here, average? It looks like it’s going to be moving pretty fast. [unknown speaker]: Do you want to stretch time? Lucas: I think it should be fast-paced. Spielberg: How long is this sequence going to be: half of a reel, three quarters? Lucas: Half a reel sounds good. Spielberg: About five minutes, four and a half minutes? Lucas: You mean for the whole sequence? Richard Edlund: I think we could do it in two or three minutes at the most. Lucas: You’re talking about a lot of shots—and the longer you drag it out, the more chances you’ve got of being betrayed. Spielberg: There are three cloud shots during the dig. There are wide-angle shots where our guys are digging on top of a cliff wall with clouds moving in; then we have angles straight up, where we are going to put our actors in front of a bluescreen, and the camera will be on the floor looking up, and overhead the clouds are rolling and lightning is going crazy; and the third shot is a super wide-angle shot, which will be a matte painting of everything down below, except campfires, and the sky will be rolling in. We have a cloud tank, don't we Kathy [Kennedy]? Kathleen Kennedy: Yes, it has to be fixed, which will cost $1,200. Spielberg: Get the tank. We’ll have to repair it. [to Lucas] We’ll turn over our material to you by the end of August, then we’re away for another five weeks or so, and then we can come back to do whatever we have to do here. Lucas: Would you would want to come up here to shoot a lot of this material at ILM in October? Howard Kazanjian: If the guy’s face is disappearing, I don’t think Steven has to stand there and watch it. You should move forward. Lucas: I was thinking about sets. When Universal made this kind of film, all they did was build a set about the size of that wall, put a door in it, add some rocks, put three or four plants in front of it—and that was it. That’s the same temple that we’re talking about. Spielberg: I don’t think we can afford to build any kind of temple in Hawaii now. We’re now thinking about a completely camouflaged set. They get to the place and only Indy, because he’s such a great archaeologist, knows where it is. He cuts some vines away and reveals just two steps; he walks up an incline and gets to some more vines—he cuts them away and there’s a hole. The hole is only big enough for these two men to climb through; it looks very man made. They just go through the mouth of the hole, and that’s it. Lucas: All it is really is a door. Production Designer Norman Reynolds: What about his exit? Spielberg: He dives for the hole—and we’ll have a stuntman propelled right through it. We’ll put a bunch of charges in there and just blow tons of debris out, with no big round ball there at all. We went over the budget on the plane [coming back from London], and we have to find places to cut things out. Lucas: I don’t think those kinds of cuts hurt the movie at all. As a matter of fact, some of that works better, because it’s more believable. If not, you might ask, Why didn’t anybody ever find this temple before? It helps Indy’s character and it saves a lot of money. 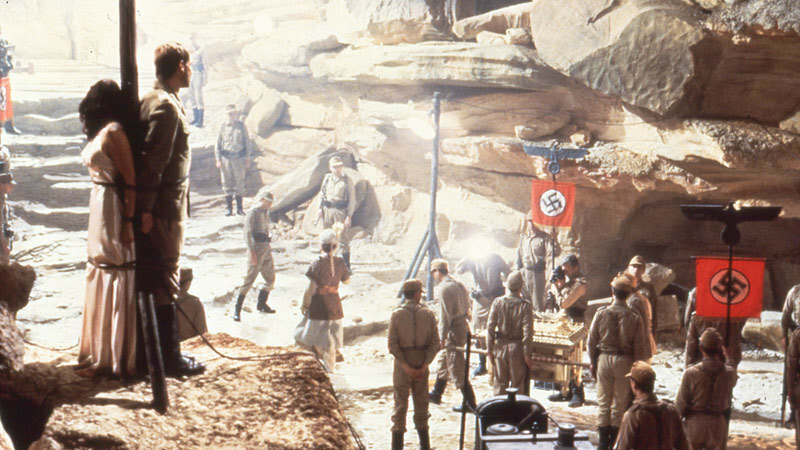 Spielberg: Of course, George, you haven’t seen the sets—they’re so grand. We’re not cheating production value. It might look dull from the outside, but once you’re inside it looks spectacular. I can’t wait to see the Well of the Souls. Lucas: Well, then that makes the inside that much more spectacular. You don’t expect it. You walk in this little door—and you’re inside a cathedral. [unknown speaker]: Has anybody made a count of matte paintings? Lucas: It’s in the dozen range, right? Spielberg: A dozen, that’s all. Under ten. I think all the concentration is really going to be on the end.